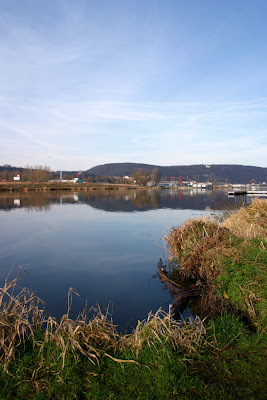 Monday's photo from a right bank of Vltava river. This is in Modrany (southern part of Prague). There's a great cycle-way on this side of Vltava that goes right to the centre of Prague. All the way along the river. There's also a chocolate factory nearby. Well, I am not sure if they still make chocolate here, but they did few years ago. That's for sure. You could smell it :) All I know now is that Nestle company has its headquarters here in a big glass building. And what is interesting in here is their abnormal use of beach umbrellas. As the sun shines inside to a wide open space in the center of the building, they have to protect themselves from the sunrays. So from the top floor you see edges of the lower floors (those are open office spaces) filled with those umbrellas making it look like at a beach. Last note. They have company's shop on the ground floor with "company's" prices for not only chocolates, but for make-up, too.